This text is the best contribution to date in describing how these challenges can be met. 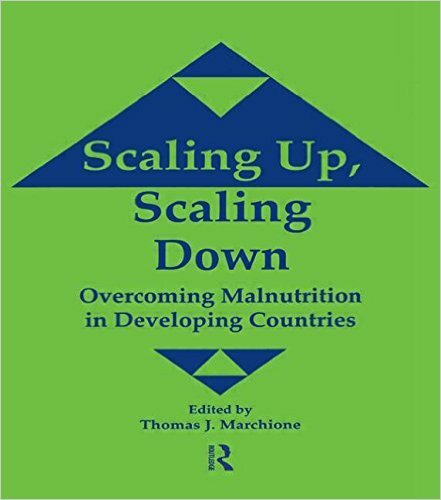 Each chapter explores the ways that aid and development organizations are learning to grapple with hunger and nutrition issues by replicating programs that work, and also by devolving control to grassroots level ownership. As such, it makes excellent reading for NGO staff or in courses on program intervention, nutrition planning, or NGO organizational development. Much of the book deals with the process of finding approaches that are feasible for large populations. For example, such is the case in Togo, West Africa, where a community sense of ownership was the goal for the programs that promoted a regional store of essential drugs to improve household access to basic health services. Peter Uvin, in a separate chapter, elaborates a typology of different ways that an effort can be “scaled up,” including, for example, 1) quantitative, whereby a program increases its membership or geographic spread, 2) functional, whereby a program expands to types of activities it includes, or, 3) political, whereby organizations take on activities beyond service delivery and advocate for policy change at higher levels. Drawing on a review of key developing country-based NGOs that have won the Feinstein Hunger Awards in the past, Uvin also identifies how NGOs undergo “organizational scaling up” in which they improve their strength, effectiveness, and sustainability, largely through improving their financial base, through expanded partnerships and enhanced management skills. An excellent example of how one project was first tested in a small area and then replicated much more broadly (or “scaled up”) to a number of regions is given in a chapter about Save the Children’s work in Vietnam to help reduce malnutrition in poor rural families. Save The Children’s “Poverty Alleviation and Nutrition Program” was begun in the coastal/delta Thanh Hoa Province, focusing on growth monitoring, mother education and social marketing of nutrition and hygiene messages, supported also with a targeted revolving loan fund that provided egg-laying hens. Conceptually, Save used the “positive deviance” concept to identify what feeding practices seemed to work among those mothers whose children were well nourished (had high growth attainment). The positive deviance approach led to an emphasis which led the program to encourage mothers to feed their young children shrimp, crabs, and green vegetables, inexpensively available in the local area. Another successful example is provided about a cost-efficient program to provide nutrition education to poor mothers in Haiti, following the “Heath model” which uses local foods and builds on the positive deviance approach. The intervention, described by G Berggren et al., reached out to mothers in poor communities with a two-week intervention including training of mothers in the use of inexpensive local foods, referral care of sick children, growth monitoring and deworming. Mothers learned by doing. Because of extensive community involvement, the program was able to scale up to the district level and was adopted in other regions. The last part of the book reviews field methods of inquiry into food insecurity. Ellen Messer gives a historical review of rapid rural appraisal techniques– originally developed by anthropologists and now used extensively by nutritionists and project planners. Building on this is the example by CARE’s food specialists, Tim Frankenberger and Cathy McCaston about the recent development of CARE’s “rapid food and livelihood security assessment,” which involves at least six randomly chosen villages and takes up to four weeks, using a multi-pronged approach that examines livelihood security of households and the community in a way that informs program design and targeting. Large group interviews, which tease out general community facilities, consumption and common resources, are followed by smaller focus groups on livelihoods. These are complemented by semi-structured household surveys as well as by nutrition and health surveys. CARE’s surveys have now been completed for many poor countries and other organizations should benefit from learning more about their findings and their approach. Hansch consults widely on refugee issues and is an editor of Hunger Notes.